Tracy Morgan thanked Walmart, the company's whose truck hit his car a year ago seriously injuring him and killing a friend, saying that the company "stepped up to the plate in a tremendous way." 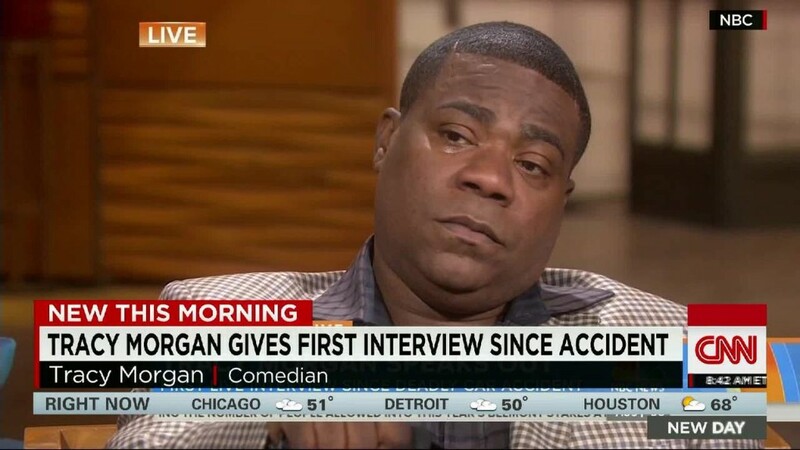 In an emotional interview on NBC's Today Show Monday in which he broke down in tears several times, Morgan said he was grateful that Walmart (WMT) had taken full responsibility for the accident and had also settled with the family of his friend who was killed, James McNair. "I'm just happy that they looked out for Jimmy Mac's family. He can rest in peace now," Morgan said. "In the beginning there was a misunderstanding but that got squared away. They came through in the clutch." Walmart CEO Doug McMillion plans to speak directly to Morgan and his attorney Benedict Morelli later this week to apologize, Morelli said during the interview. "I thought that was a huge gesture," he said. The Walmart driver was traveling more than 20 mph over the speed limit when his truck struck the limo bus that Morgan, McNair and others were traveling in on the New Jersey Turnpike in June 2014. Safety officials said the truck driver had been awake for more than 24 consecutive hours before the crash. Morgan's interview was his first public appearance since the accident. He said he does not remember the crash itself and has still not been able to return to work but hopes to do so. "I love comedy. I can't wait to get back to her. But right now my goal is just to heal and get better. I'm not 100% yet," he said. Morgan was in a coma following the accident, and suffered multiple broken bones and brain trauma. He said he has good days and bad days, the latter when he forgets things and has headaches. But he said the emotional loss has been more difficult than the physical injury. "Bones heal. The loss of my friend will never heal," he said.